Both parties must be at least eighteen years old and single. If either party is under the age of eighteen, parental consent is required. If a couple meets these standard requirements, they are qualified to begin planning their Pocono Mountains Wedding. If you choose the Pocono Mountains as your wedding location, you can apply for a marriage license at the office of the Clerk of Orphans’ Court in any Pennsylvania State Courthouse. Both parties must apply in person, and may pick up the marriage license after a mandatory three-day waiting period. The license is valid for 60 days, and may only be used in the Commonwealth of Pennsylvania. 1. Identification - Both parties must present a birth certificate (raised seal) and/or a driver’s license or passport depending on the county in which the application is filed. Some counties do not accept birth certificates. 2. $28-$50 in cash - The cost of a marriage license varies among the four counties in the Pocono Mountains region. The cost in Monroe County is $40; Wayne County $35; Pike County $32.50 and Carbon County $50. *Prices as of June 2014. Details subject to change. 3. Divorce Decree - A certified copy of each divorce decree, or death certificate if widowed, must be submitted by each previously married party at the time of application. NOTE: All forms submitted for a marriage license must have original signatures. So, you’re in the bridal party . The group’s been pinning and you’re tasked with organizing the “last fling before the ring.” Before you book a costly spree, consider a trip to the Pocono Mountains. According to Destination Weddings & Honeymoons Magazine, a destination wedding is one that takes place at least 100 miles from the bride&apos;s residence. 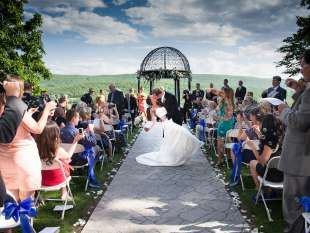 Make all your wedding wishes come true in the Pocono Mountains.